The High Plains have their quiet times. Sure, there are the vicious winter storms, the days when the wind blows hard, and the summer thunderstorms. But other times the wind may be just a light breeze through the grass, maybe a hawk soaring overhead. 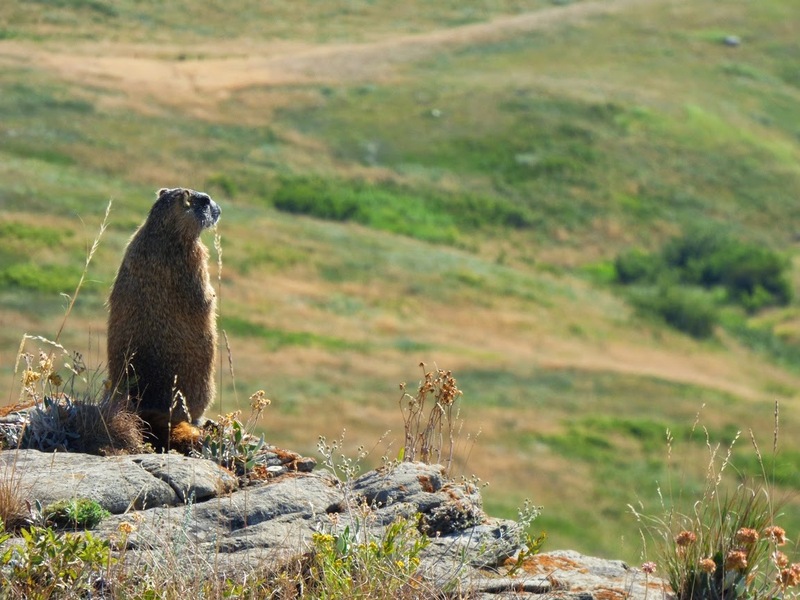 Or a huge marmot standing guard on a sandstone outcrop. But I can also stand in this place and imagine a similar quiet day a few thousand years ago. It's quiet, but then the ground starts to tremble, and a dust cloud rises over the crest of the low hill. The birds startle and take flight, the marmot dashes for cover, and suddenly over the ridge comes a thundering herd of buffalo. They're stampeding, and the leading animals start to shift directions, but then suddenly a strange figure jumps up, yelling and waving limbs. It might be a wolf, it's hard to tell in the panic, so the herd shifts direction once more. The leaders now realize they are headed for a precipice and they try to stop, but it's too late. They go over the edge, pushed by the animals behind. They impact on the rocks and bones below, most of them dead immediately. In a moment it is over. People emerge from their hiding places and start to butcher and process the meat, bones and hides. It has been a successful hunt and they will have enough food and furs to make it through the difficult winter. There is a seven story building in this picture. Can you see it? The First Nations people of Canada and Native Americans of the High Plains depended on the buffalo for survival. They made use of the meat, the fat, the bones, and the hides. But anyone who has ever seen one of these immense animals knows that they would a dangerous adversary in a hunt. They can be as long as eleven feet and weigh a up to a ton. They can easily outrun a human, capable of speeds of 35 miles per hour. Though it was done, bringing one down was a difficult and dangerous proposition. 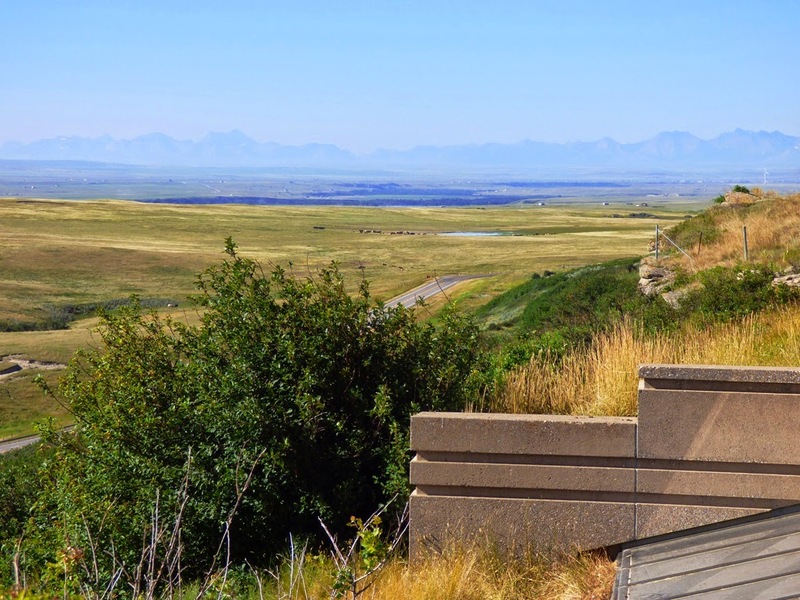 We were in southern Alberta on our Northern Convergence tour of western Canada, and were making our last stop in the country at Head Smashed In Buffalo Jump World Heritage Site. At Head Smashed In and similar localities, the geology provided a safer way to hunt the animals. 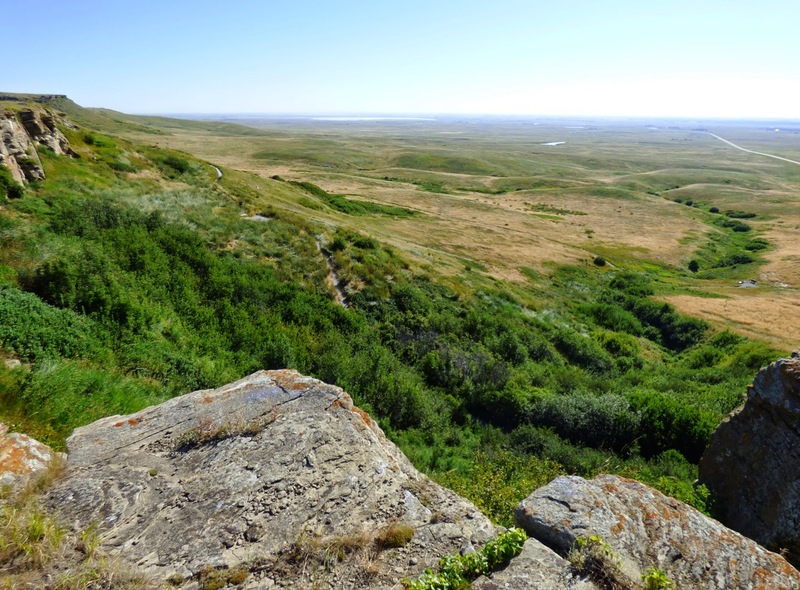 At the edge of the prairies where the mountains rise from the plains, the land is not so flat as it is further east. The convergence far to the west compressed and pushed up the Rocky Mountains. The soft Cretaceous mudstones and sandstones underlying the high plains were also pushed up into broad swales and low hills. Ice, water, and wind exploited fractures in the rock, and erosion ate away at the edges of the hills, exposing vertical cliffs of sandstone. 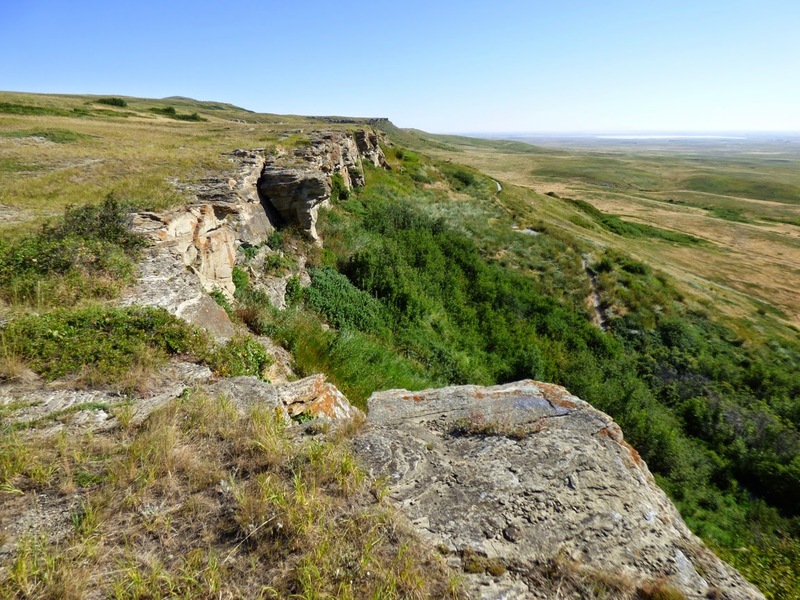 Just such a cliff is exposed in the Porcupine Hills outside of Fort Macleod, Alberta. For at least the last 5,800 years, people have utilized the cliff here to capture and kill buffalo. A spring emerged from the base of the cliff, providing water at the kill site (the green watercourse is visible in the picture above). The Old Man River flows in the flats below, providing sheltered sites for villages. 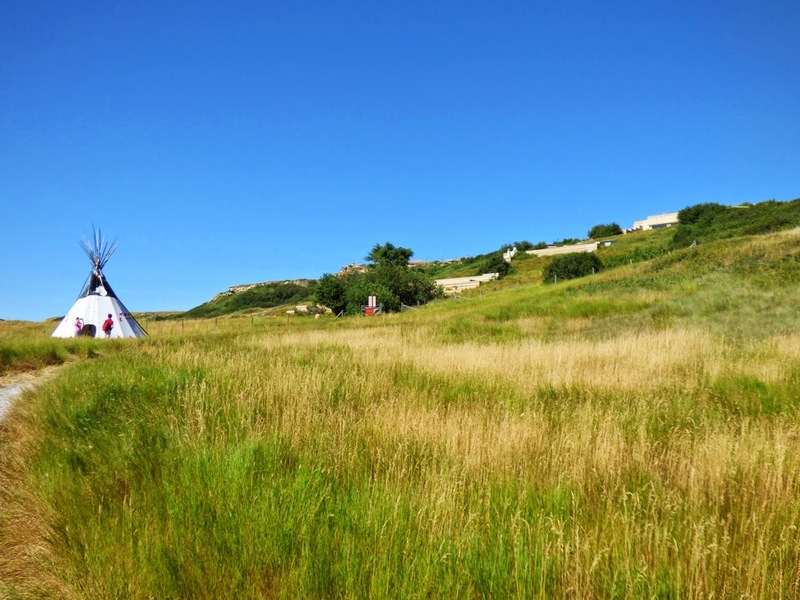 Tipis have become such a stereotype that some might think that most Native Americans lived in them. I groan inwardly whenever I see one at "Indian Stores" or southwest tourist traps. But the tipi at Head Smashed In was an appropriate sight. The tipis were an excellent shelter on the windy plains. They were portable, an important consideration for a nomadic people. 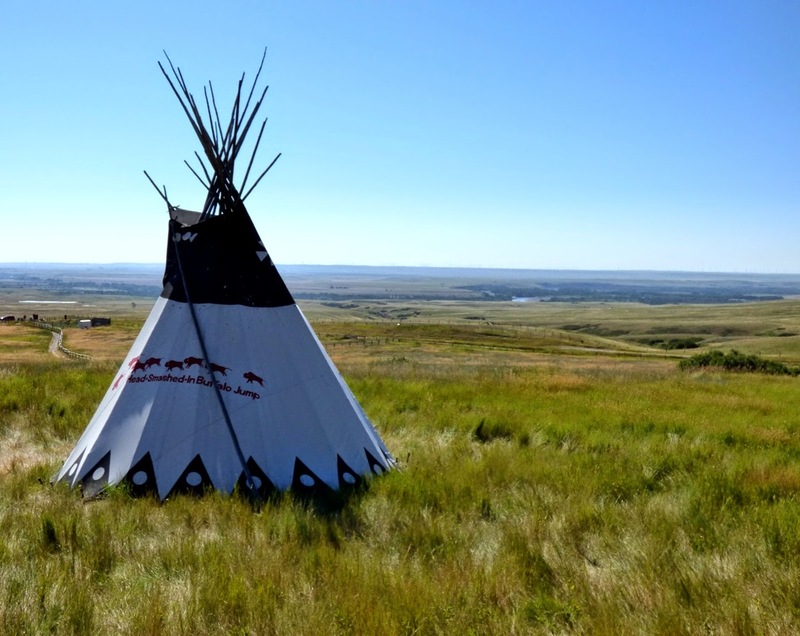 I know of paleontologists in the region who tried to camp in modern nylon tents, but gave them up for tipis, which were more comfortable and more durable in windstorms. The site was declared a World Heritage Site in 1981 for its archaeological value. 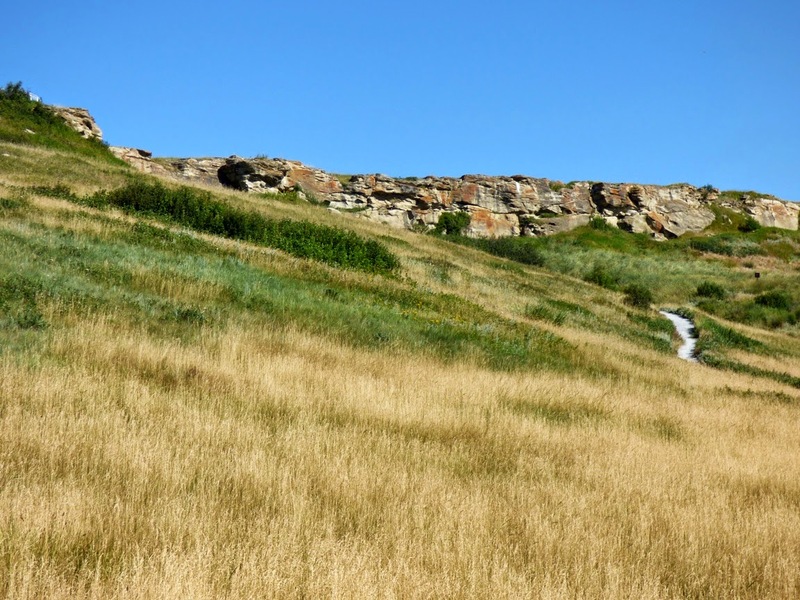 Excavations 39 feet deep in the cliff show a complex history of buffalo hunting going back 5,800 years (two spear points show activity in the area as far back as 9,000 years. The visitor center was constructed to blend in to the landscape, and does so admirably (see the picture above). There are trails to the top of the cliff where some cairns from the hunts can still be found. A trail also loops around the base of the cliff. 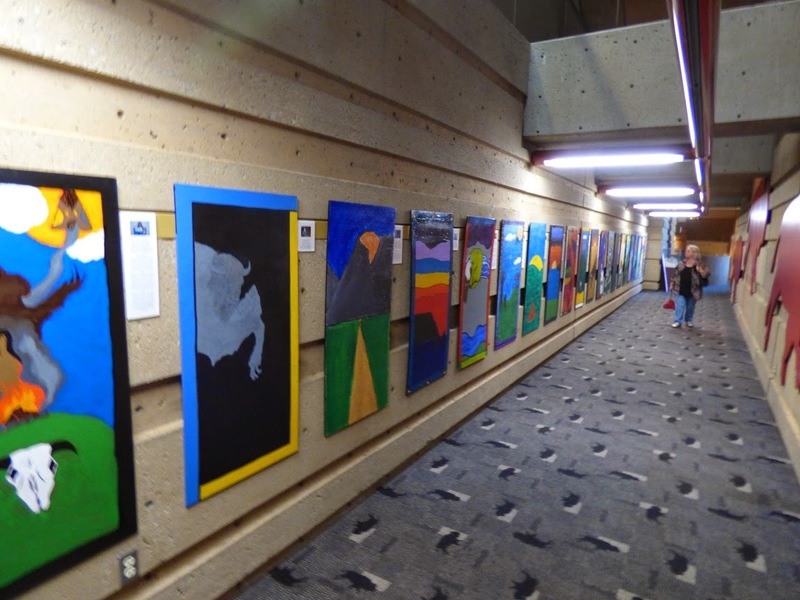 One of the nice surprises inside the well-designed center was a hallway lined with numerous paintings and artwork by First Nation students representing the oral histories of their culture. About the name of the place. In the Blackfoot language it is called Estipah-skikikini-kots. Legend has it that a young man decided to watch one of the buffalo hunts from the base of the cliff. He picked a bad spot, and was crushed beneath the weight of the falling animals. The name doesn't exactly inspire confidence in the site as a destination when traveling in the region, but it is indeed a fascinating place to visit. It's full of history, but it is also a place of wide-ranging views and scenic beauty, and despite the name, serenity.